Fans on Twitter are convinced Real Madrid and Portugal star Cristiano Ronaldo is set to move ahead of his nemesis Lionel Messi with a sixth Ballon d’Or this year. The 33-year-old has made an incredible start at this summer’s World Cup, scoring all four of Portugal’s goals in just two games so far to help his country to a well-earned draw with Spain and today’s win over Morocco. While for a long time many felt Messi might just have the edge over Ronaldo in terms of overall greatness, that perception is starting to shift as the Portuguese goal machine continues to thrive in the biggest games. 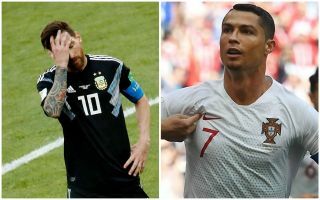 With four Champions League final wins in the last five years, a Euro 2016 win two years ago and now this superb start at the World Cup in Russia, Ronaldo is showing that big-game impact that Messi has arguably failed to in recent times. The Argentine missed a penalty as his country could only draw 1-1 with Iceland in their opening World Cup match, and for all his quality he has not been able to get Barcelona anywhere near a Champions League final since they last won it in 2015. Ronaldo four goals, Messi nil. On Ballon d'or it's looking like 6-5. Another record for Ronaldo. Incredible achievement & just constant accomplishment from this guy. Could very well break World Cup goals record the way he’s going. On for another Ballon D’or too. What he is doing with club & country, as leader and talisman is just insane!